If you are not already apoplectic that Russian hackers, according to the CIA, meddled in the recent presidential campaign to game the system in Donald Trump’s favor, then consider what impossibly steep recompense Vladimir Putin will demand for making Trump the most powerful person in the world. Of course, Trump thinks he’s all-powerful because his flimsy ego, which is more suited for poorly attended victory tour stops than daily intelligence briefings, simply can’t entertain an alternate narrative. He’s also busy stacking his Cabinet with Putin-approved appointees, like secretary of state nominee Rex Tillerson, ExxonMobil’s chief executive. Trump is too vain to recognize that he’s nothing more than a Kremlin chew toy, an easily manipulated means to Putin’s nefarious ends. It’s gut-check time in America. During the campaign, American intelligence officials told the White House that they had “high confidence” that the Russian government was responsible for hacking the Democratic National Committee’s computer servers. 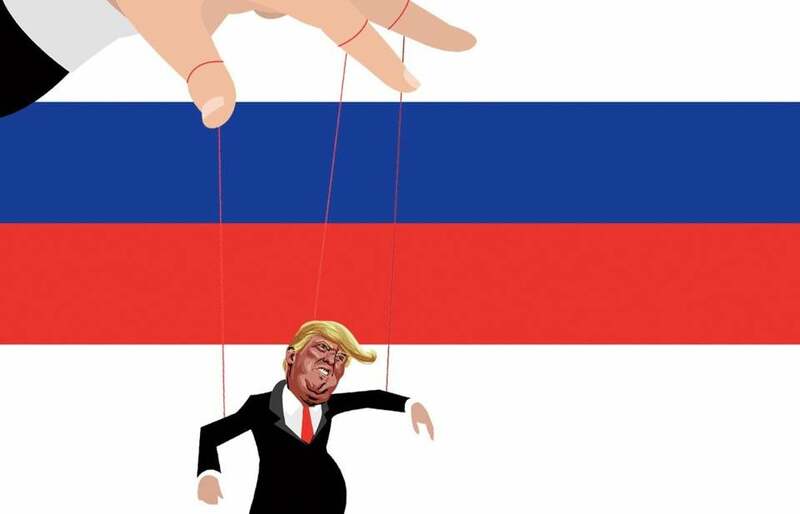 Somehow, the likely fact that a foreign country, one with whom the United States has a historically adversarial relationship, was messing with our electoral process was treated like a bad subplot in a drawn-out melodrama. Even after Trump said last July, “Russia, if you’re listening, I hope you’re able to find the 30,000 e-mails that are missing,” in a reference to Hillary Clinton’s deleted e-mails, the story found no traction. In retrospect, it’s as if Trump was flaunting his shadowy connections. Now with the CIA’s damning confirmation, Trump’s disparagement of the intelligence agency, and his refusal to condemn Russia, this is a harsh litmus test for both political parties, as well as ordinary Americans, to see how they will push back against Trump’s mendacity, misdirection, and disregard for the rule of law. The president-elect mocked the US intelligence assessments that Russia interfered in the election on his behalf. While Senate majority leader Mitch McConnell said he supports investigations into possible Russian cyberattacks, he doesn’t believe the matter warrants a special select committee — like the one that spent years investigating Clinton and her role in the Benghazi tragedy. (Now that Clinton, the partisan committee’s main target, has been vanquished, it has been quietly disbanded. It achieved nothing beyond knee-capping Clinton during her presidential run.) For those in the GOP still undecided, perhaps they should pretend that foreign cyberattacks tried to grease the wheels to the White House for Clinton. And helped her set up her private e-mail server. In Benghazi. This is also a moment of truth for Democrats, who need to stop bringing paper knives to gunfights. Stop pretending there is common ground to be found with Trump, who will huff, belittle, and bully Democrats demanding answers about his unsavory ties to Russia. He’ll dash off exclamation point-laden 3 a.m. tweetstorms. With so much at stake, those Twitter tantrums can’t matter. The Democrats’ only concern must be uncovering the truth about what happened during the 2016 campaign. So far, public outrage about the CIA’s findings has been alarmingly muted. In many ways, this is a matter too important to be left only to politicians. Ordinary citizens must agitate and pressure their representatives to conduct a full, thorough, bipartisan investigation. They must text, tweet, and take to the streets, if necessary. This is not business as usual. This is nothing less than a referendum on American resolve in the face of an unparalleled crisis. Trump’s presidency has yet to begin, but is already proving more problematic than even his greatest skeptics could have imagined. In five weeks, an oligarch-in-chief aspirant will become the 45th president of the United States. If we opt for inaction now, how quickly will Trump dangerously compromise this nation to appease his master in Moscow? Renée Graham is a Globe columnist. Follow her on Twitter @reneeygraham.